What happened to 5? Well, when you beat the closest contender (Brewers still, amazingly), you get -1 for your win and -1 for their loss! Close game today and the Cubs spectacular pitching was a bit off (no no-no or 1 hitters), but they delivered CC his first loss as a Brewer! Houston lost with their ace at the mound, Oswalt, which means a sweep means a clinch @ Wrigley! If you're holding a Thursday ticket, I'm jealous. Hold on to it dearly. The Big Blue Train may make it's big celebration stop that day! It appears that Milwaukee less Yost is still the chokers we've come to know and love in September. Today is Young Cub Fans Day. Here's Nikko and his blankey from LA. His dad, Ron, and mom were transplanted to LA, but they still see their Cubbies when they come to LA and San Diego. Oh, and Nikko was born on January 4th and brings Magic Number 4 good luck! Justin from Nashville sends up Garrett in his Cubbie Blue! I think I see a dog behind him. Representing the ladies tonight is two year old Addison who happens to be named after some street in Chicago that may border the Friendly Confines. 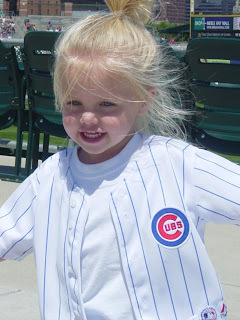 Here she is at her first Cubs game, actually an Iowa Cubs game! She looks forward to going to Wrigley next year with daddy. Thanks 'Bleacher Creature' Rick for the photo! Here's five month old Evan with his Cubbie Bear! Thanks Jean! 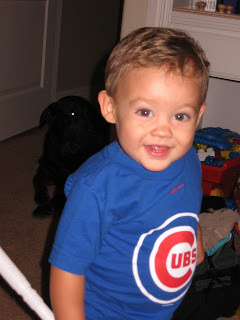 Grayson from Crosby, ND smiles to all the Cubs fans out there. Grandma Mary is proud to have raised her son as a Cubs fan and to see the legacy passed down. 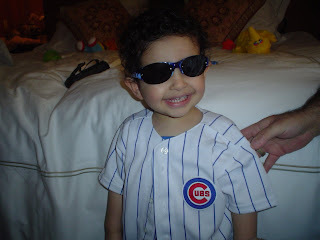 Arthur from Burbank, CA "Lookin' Cubbie Cool" at 20 months! Thanks Daddy Armen. 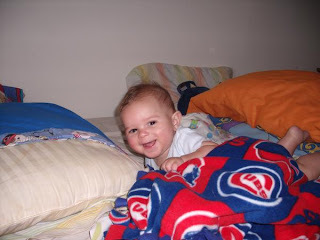 Thanks for all that have submitted photos to 2008@cubsmagicnumber.com. Please keep sending your photos with a short story. We may use them later on, perhaps during the playoffs where we count down the wins to a World Championship! HUGE WIN tonight!! We tacked on runs and made the DIVISION TITLE a forgone conclusion. Now if we can just SWEEP these guys, we'll not only force them to watch us celebrate, but END what LITTLE HOPE they have for making the post season!! Great job tonight men, great job. CUBBIES!!!!! Hey Chicago What Do You Say........ Number 4!!! Doesn't the Mets/Phillies battle actually play into the wild card now? As of tonight with a Phillies win and a Mets loss (and of course Brewers loss) the Mets now have the Wild Card by 1/2 game. If Phillies win tomorrow, Mets win tomorrow, and Cubs beat the Brewers, Magic Number drops to 3. 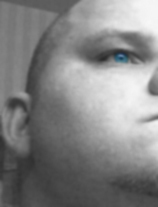 Am I correct, or am I crazy?! Who cares. Whoever is behind us is just a speed bump to the World Series. CUBBIES! Wild Card isn't going to matter at this point...Cubs win today Magic number is 2. Beating the Brewers will give the Cubs a playoff spot. That's what matters. What ALSO matter is home-field advantage in the playoffs. 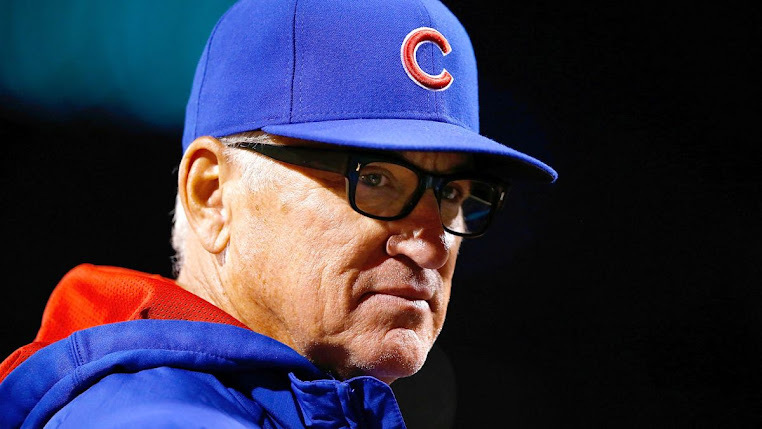 If the Mets or Phillies have a better record than the Cubs, then the Cubs will end up playing four games away in the NLCS. With respect to home-field advantage the Magic Number is 5 (after 9/17 games) vs. the Phillies.